You might be wondering why I chose this photo to head up this post about Gnocchi. It's a simple reason, really. 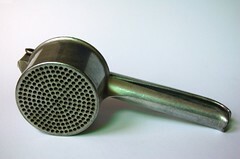 This object is a key to making excellent Gnocchi - and it's an inexpensive device called a Potato Ricer. This one was given to me by my mother, her own ricer came with her when she migrated from Italy, along with a few other things that had yet to be seen in Australia. But that's a whole other topic. Having obtained the best training in the kitchen alongside my mother, the secrets of Gnocchi (amongst other things) became clear, follow these are you are half way there. Lots of recipes around advocate the use of eggs - that's because they are lazy. Adding eggs will help the gnocchi stick, but in using eggs you've made your mix a lot softer so you must compensate by adding a lot more flour and that leads to those heavy gnocchi. Coliban, Desiree,Nicola, Pontiac, Sebago, Toolangi Delight. Using a large pot and lots of water, boil the potatoes whole and in their skin. 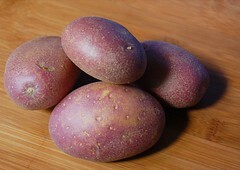 Try to choose potatoes that are roughly the same size and also choose medium sized ones. If your potatoes are too large, the skins will start to crack before the core is soft. Test the potatoes for doneness with a skewer, you don't want to feel any resistance. Once they are done, take them out of the water. If you have asbestos fingers you can peel them before putting them through the ricer but I'll let you into a secret. You can pop them through the ricer unpeeled - the skin won't be pushed through the holes, it will stay inside the ricer. Once all the potatoes are mashed, form them into a ring. 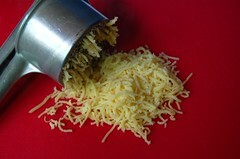 Using a grinder if desired or just a fine salt, sprinkle it generously over the potatoes. As with pasta, you cannot make gnocchi without salting the potatoes. The next step will decide whether you have light gnocchi or lead balls. Flour. As a rough guide, for every 500g of potatoes use at most 175g flour. To make sure you are miserly with the flour, pre-weigh the flour that you require based on the potato weight. Place it in a bowl and only take your flour from the bowl. 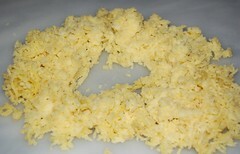 I then would sprinkle half the flour over the potato ring and then bring it together to form a dough. If it's still too sticky, sprinkle a little more flour from the bowl. This can really only be done with your hands, you have to feel the dough. Your aim is to get a dough that is fairly smooth and no longer sticky. Using a knife cut the dough into manageable portions. Lightly dust your bench from your bowl of flour and begin to roll the dough to form a long thin sausage. I would like to plead the case for small gnocchi, no bigger than then the nail of your thumb. They cook quicker, they taste better. Please, no more golf ball sized gnocchi! Once you've made your thin sausage, using a knife, slice the dough into even sized forms. To get the traditional ridge marks, using the back of a fork, press your index finger into the dough as you roll it up along the tines of the fork. Repeat this process with the remaining portions of dough. The last step is probably the most daunting. It is something that as a child would amaze me. How something that is just flour and potatoes doesn't just dissolve into mush as they hit the water. The technique for cooking is the same as for pasta, you must have a large pot of boiling, salted water. Give the water a good stir and then drop in the gnocchi. They will drop to the bottom, stir again with a wooden spoon, making sure the water remains at a rolling boil. 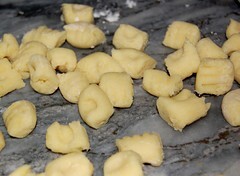 As soon as the gnocchi rise to the surface, they are done. Scoop them out and serve with your favourite sauce and a sprinkle of Parmigiano-Reggiano. So what sauce is this? This was a very quick sauce made from a sauté of finely sliced red onion and slivered bacon, to which fresh (or frozen) green peas were added along with a generous grind of fresh pepper. When you've popped the gnocchi into the boiling water, add small cubes of fontina (or gorgonzola if you like something with a little more kick) to the sauce along with a spoonful of the gnocchi water and stir - it will melt and form a tasty creamy sauce. 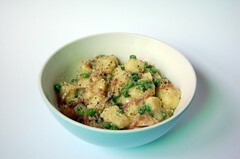 Place the cooked gnocchi straight into the sauce and toss through, serve straight away with an extra grind of pepper. Wow, what useful tips! I've made gnocchi before, but only using a recipe from Giada de Laurentiis. I believe it did call for egg. I really appreciate your how-to! Gnocchi seem to be one of those things that people are a little scared of - I should have mentioned that they are something you can make with just 1 potato and practice with that. Once the confidence builds and you know the texture you're after, then you can move onto larger amounts of potato. Traditionally, eggs aren't used with potato gnocchi but they are with semolina gnocchi, perhaps that difference got lost in translation, so to speak.